Dayton is filled with historic and beautiful neighborhoods, from the city to the suburbs. One of Dayton&apos;s most historic lies just south of downtown, in a charming setting called Oakwood. In downtown Dayton find Main Street and head south. This is Ohio Route 48. As you are heading south you see the huge Miami Valley Hospital on the east and on the opposite side the Montgomery County Fair Grounds. Crossing Stewart Street on both sides there are lots of green space and a few modern buildings. This whole area was where cash registers were being manufactured by National Cash Register. The cash registers were all mechanical and here is an old postcard of some of these buildings. With electronics and computers these were torn down in the 1970’s. On the west side you see Cox Media Enterprises which is a former NCR building. As you continue south you see a sign welcoming you to Oakwood. 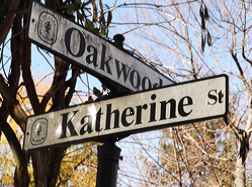 Oakwood is an inner suburb (sometimes known as a "first-ring" suburb) and it predates those of the outer suburban or exurban counterparts. The road is now Far Hills Avenue. At the turn of the twentieth century, Oakwood was primarily farmland situated on a hill directly south of the City of Dayton. In 1913, when a disastrous flood devastated downtown Dayton (the Great Dayton Flood), advertising began to tout Oakwood property as "275 feet higher than the intersection of Third and Main Streets." 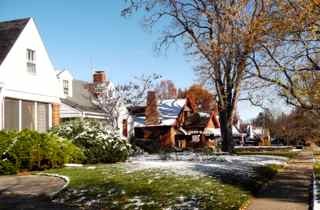 In light of this real estate advantage and its location adjacent to the City of Dayton, Oakwood’s largest period of growth began and by 1930, the village population numbered over 6,000. 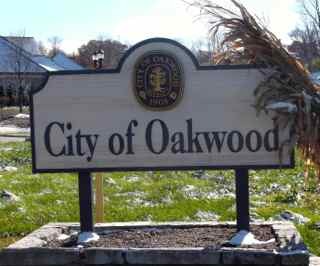 Oakwood incorporated as a city in 1908 and in 1932 adopted the Council/Manager form of government that is still in place. As you are continuing going up the hill you will see the Oakwood High School on the east and notice that wide grass strips are separating the north and the south roads of Far Hills. In the old days there were tracks on Far Hills Avenue and streetcars were carrying passengers between downtown Dayton to Oakwood. When the rails were removed Oakwood wanted to keep Far Hills roads separated. On the west side you see The Oakwood Historical Society http://www.oakwoodhistory.org. If you pop in you will see many interesting things going on in the area. 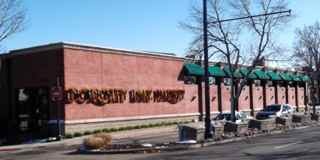 As you continue along you will see the shops of Oakwood and on the east side a famous grocery store, The Dorothy Lane Market. This is still a local store that now has two other grocery stores further south. If you wander in the Dorothy Lane Market you will find the model of their original store and it’s name came from the main road east/west which is Dorothy Lane. Next you want to turn west on Park Avenue and when you intersect with Oakwood Avenue turn right (north) and you will see Smith Gardens. 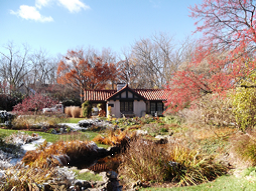 This is a lovely garden owned and operated by the City of Oakwood. Keep heading north and look at all the interesting and varied homes. On Katherine Street (the ONLY “street” in Oakwood) turn left (west) and when you are at the intersection of Katherine and Runneymede Road you are in what was a significant event. 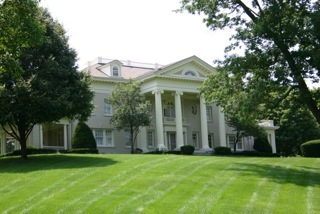 During World War II, the Runnymede Playhouse (which is a little south and west and where those two modern houses are) hosted Unit IV of the Dayton Project. The Dayton Project was a little-known part of the Manhattan Project involved in creating industrial quantities of polonium for use in the neutron generating triggers of the first atomic weapon. In the late ‘40’s this whole area was torn down and tons of the dirt were shipped away. You can then head down the hill (north) and at the corner of Runnymede and Thruston turn west (left) and wander around. Southview, Haver, and Northview all have gorgeous and old homes. When you hit Schantz, or Rubicon you will get back on Far Hills, Route 48, and you will have seen amazing old and interesting houses in Oakwood. Please Note: The Dayton CVB has compensated me for my thoughts on Dayton&apos;s Oakwood Neighborhood.